Well, here is a surprise. 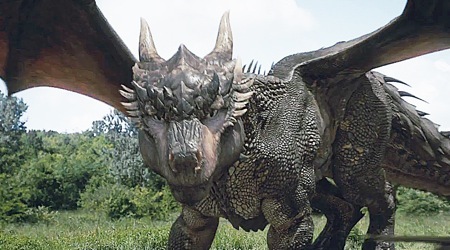 Another "Dragonheart" movie? Lets be honest here, how many of you knew this movie even existed? Probably not a whole lot and it actually is the fourth movie in the series already. It doesn't matter too much whether or not you have seen any of the previous movies, sine this movie really can be seen as a stand-alone one, though it is very obviously very heavily influenced by the original 1996 movie. And by influenced I mean that it is basically doing the same thing as the original first movie. There really isn't anything too original or surprising about this movie, but I still see as decent entertainment, especially for kids. And lets be honest; these movies are more children's movies than anything else really. It is a low-budget movie, but the fact that it is backed by a big studio still ensures that it is a good looking movie, with some decent locations, sets, costumes and special effects. Nothing too fancy, but certainly something that still appeals to the eye and never screams 'low budget' to you, with the exception of a few effects shots. There also still is plenty of action in it, which all helps to keep the movie both exciting and fun to watch. I also wasn't too fond of the main character, played by Tom Rhys Harries. In a way you also aren't supposed to like him, but even at the moments that he is supposed to be more likable he really isn't. At least not as much as he should be. I mean, he is supposed to be the hero of the movie. The one to carry the movie, besides the dragon of course, who this time around gets voiced by none other than Sir Patrick Stewart. In all truth and honesty; I liked this movie far better than I expected to do. It is a simplistic- but at least still a very entertaining movie, that besides is quite well made, by low-budget- and lame cash-in sequel standards.